The time has come for Abel Tesfaye a.k.a. 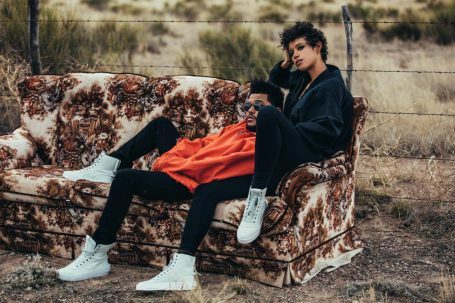 The Weeknd, PUMA’s creative collaborator and global Brand ambassador, to finally release the much-anticipated debut collection with the Global Sports Brand. Teasing some of the key styles during his current Legend of the Fall World Concert Tour that kept his fans, sneakerheads and the fashion set intrigued, The Weeknd is ready to show the world the new styles that reflect his personal style merged with PUMA’s sport-inspired silhouettes. Along with The Weeknd’s musical successes as a Grammy-winning artist and Billboard chart topper, he has made an immense influence in the streetwear industry. He makes his own rules, lives to create and has an eye for beauty in the unexpected. The debut PUMA x XO Collection is him personified and here to break the rules of streetwear: bomber jackets, boots, and kimonos are finished with camo, suede, and denim. Classic meets futuristic. Military meets luxury. The campaign was shot in mysterious Marfa, Texas, a perfect backdrop that compliments the PUMA x XO creative language. The collection releases in 3 drops, each differentiated by a unique aesthetic. The first drop is the first-ever PUMA x XO footwear – the PUMA Parallel. Inspired by military and utilitarian gear, the all-new silhouette is a mid-cut sneaker boot that’s fully decked out in luxurious Italian nubuck leather upper. The smooth rubber midsole features IGNITE cushioning technology. The boot boasts of a contemporary blocked heel design with an extended Formstrip and co-branded labels. Stay tuned for more information on the succeeding drops that include footwear, apparel and accessories. Follow @PUMASporstyle and @PUMA for drop information.